The thermostat can be configured with master mode. When the thermostat is off the master function, one thermostat controls a room air conditioner in the central air conditioning system. When the main control function is enabled, it is possible to switch and control multiple air conditioner extensions. This thermostat can not only be used with the SDR-FC5/10 for centralized control of two- or four-pipe blowers, but also can be used with the SYDRON central control series modules to perform Modbus centralized control of VRV air conditioners, while also controlling floor heating through modbus docking. New style, three-in-one control function. Also supports environmental monitoring system PM2.5 numerical display. The thermostat has its own temperature sensor, and it can provide the air conditioner with the room temperature value to allow it to complete the automatic room temperature feedback function without the air conditioner having a temperature sense. The device operates at a safe voltage of 24VDC and is below the 25mA power consumption current. The thermostat enters the standby energy-saving mode, and both the key backlight indicator and the OLED enter the semi-bright mode. This design meets the needs of low carbon and environmental protection. The device is designed as an MCU pure hardware architecture and has local data processing and channel control. The overall power consumption of the panel is low, and the task processing time. The panel communicates via the dedicated bus S-Net to ensure the stability and reliability of data transmission. CHVAC can be installed in a single standard 80 bottom box, while double connection can be installed in two standard 80 bottom boxes, which is in a uniform style with MARS series panels, so that the panels can be installed more neatly. 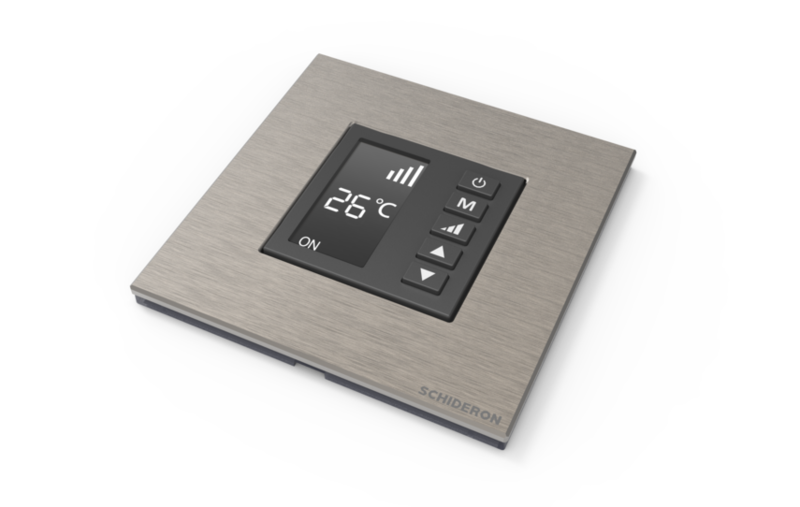 CHVAC - THC - 01 thermostat is provided by SCHIDERON for temperature control and solution of air conditioning system energy saving control, has five intuitive can match the intelligent graphic buttons, thermostat is very convenient in a standard 80 bottom box, safe voltage of the thermostat is very easy to install on the wall as a part of a complete intelligent control system.This thermostat also provides a number of different color and style of the outer frame for different occasions or people to use, in line with the customized requirements.MARS thermostat is a MARS range of products with delicate styles that add color to any room.From aluminum alloy to glass, it is used with the panel frame of MARS series. No matter what style is adopted in the home decoration, with the free collocation of environment and switch panel, the environment can be highly integrated.In addition to the appearance and color materials, the chvac-thc-01 thermostat can also be used by users according to different operating modes of different types of air conditioners.Air - conditioning and geothermal systems can be freely matched and controlled.It can also be simply combined with sdr-fc5/10 for the centralized control of two or four wind turbines.MARS panels are popular with designers and are widely used in various hotels and smart home projects.